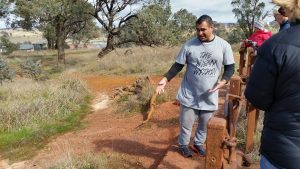 In September 2017, a group of ANTaR ACT supporters joined Rich Allan from Traditional Owners (www.traditional-owners.com.au) to tour sites around Gunghalin. 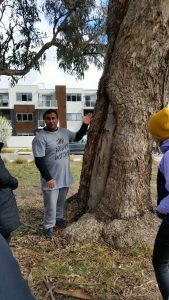 We started near the town centre to see a ring tree, where people had manipulated the trees when small to create a unique tree that would have been a marker in the area. 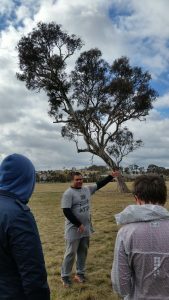 In Crace, we saw two more trees, one of which was a water tree – a ring tree that had been created to hold water – and the other a scar tree. 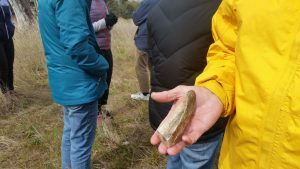 We then went to an area where, in the middle of a suburb, stone tools had been created and could still be found. 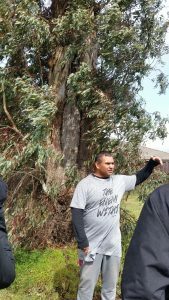 We saw a canoe tree, where (again, now between suburban houses), was a magnificent tree with a huge scar showing where bark had been removed to create a canoe. 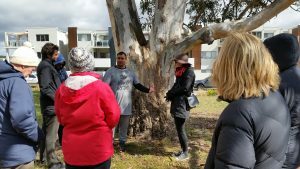 Finally, we finished in Forde, learning about the songlines of the area and sharing in lunch of kangaroo cooked in traditional ways. 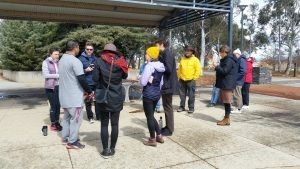 A fascinating morning, and well recommended to learn much about the lives of the Ngunnawal people who lived in Canberra for so many thousands of years.